A new vacuum pump inlet trap featuring a high-capacity single filter element for processes that generate large particulates such as LPCVD, PECVD, and ALD is being introduced by MV Products of North Billerica, Massachusetts. The MV Multi-Trap® High-Capacity Vacuum Inlet Trap for processes that generate large particulates features one 13” H x 14” dia. filter made from a pleated high-temperature polyester. Providing a 40 sq. ft. surface area, this trap can retain 60 gms./sq. ft. of particulates which makes it ideally suited for protecting vacuum pumps in LPCVD, PECVD, and ALD processes. 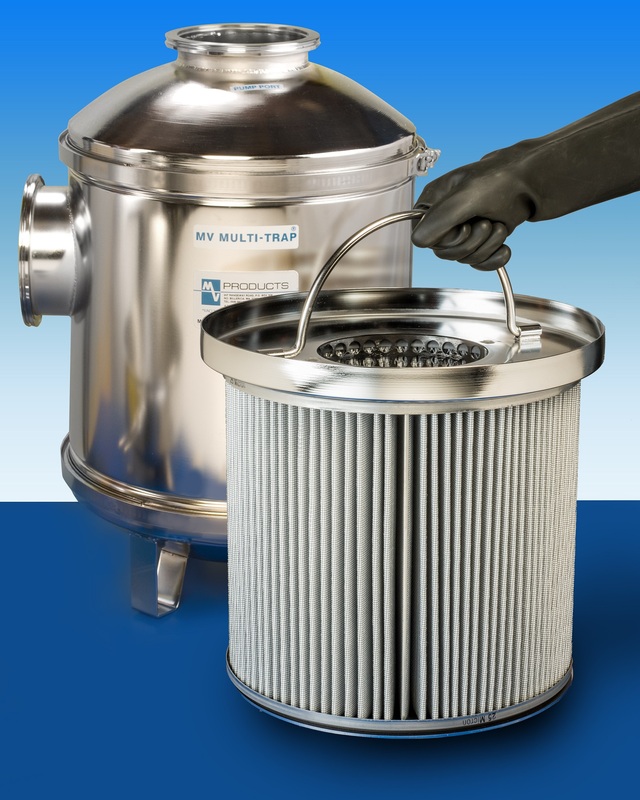 Available with 25 micron and 100 micron ratings, this single filter for the MV Multi-Trap® High-Capacity Vacuum Inlet Trap fits a standard 16” dia. all stainless steel housing with ISO 160 ports offered in straight-through and right angle configurations and provides conductance > 2000 CFM @ 1 TORR. A retrofit kit is available for MV Multi-Trap® 16” Models currently in use. The MV Multi-Trap® High-Capacity Vacuum Inlet Trap is priced from $5,295.00 (list) complete. Quotations are provided upon request.